Forget about the GoDaddy ad that has raised controversy and the deflategate. The big story of Super Bowl XLIX is about what Americans are estimated to spend in celebrating the big games. According to the National Retail Federation, Americans will spend $14.31 billion. What is even more remarkable is the tab for the partying has increased by close to 65% over the past eight years. In 2007, the price tag was just $8.71 billion despite TV viewership increasing at a much lesser pace during that time from 93 million to 111 million. The tab for the Super Bowl covers everything from new television sets to chicken wings, which this year an estimated 1.25 billion will be consumed on Super Bowl Sunday. It is also estimated that over 9.5 million new televisions will be purchased in the weeks that lead up to the big game. In all, the NRF estimates that $89.05 per person will be spent on average to just watch the game. The experts in the retail industry say the desire to buy at this time is because the game is part of a much bigger culture with more emphasis on what takes place between plays with the expensive television ads and the halftime show filled with famous entertainment stars. It means that not only are players being watched as they chase around a pigskin, but the year’s biggest spectacle is being viewed. Because of that, Americans are given an excuse to have a party, especially with food and at a time when the U.S. is gourmet obsessed. No longer do you have the days when a few bags of chips sufficed on the day of the game. 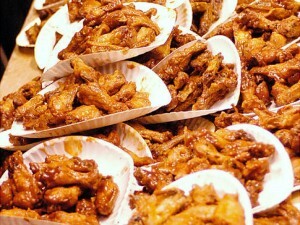 Now fans order special items including the 1.25 billion chicken wings. One Buffalo Wings restaurant estimates it will sell more than 32,000 wings for the Super Bowl. One company that specializes in mail order foods from restaurants around the country says its business on the weekend of the Super Bowl increases by tenfold.